I learned about this soup when I took the 7-day juice fast at the Wellness Education Center (WEC) in Kalispell MT (1); it is a recommended soup for the first night of breaking the fast, although you cannot add the avocado until the second night. For the first night, use the zucchini instead of the avocado. This is similar to Tomato & Avocado Soup, but without the tomato, and also to Creamy, Chilled, Raw Carrot Soup, but without the avocado. This recipe is adapted from the WEC Juice Fast (1) course book. 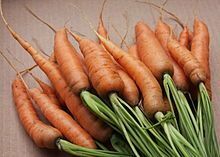 You need a juicer to make the carrot juice for this recipe; however, if you don’t have one, you can grate them finely and then puree in a blender with some added water. I’ve not made this yet, so not sure how many carrots it would take, but at least 3 – 4 large carrots. If you don’t have a juicer, grate the carrots finely and place in your blender and puree. 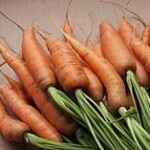 Keep adding more carrot until you have about 4 cups (or less if quite thick, and thin with filtered water). Otherwise, add carrot juice in step 3. Add avocado (or zucchini), bell pepper and onion to blender, and blend until smooth and creamy. To serve, and fresh squeezed juice of 1/2 small lemon. You may also wish to add 1 – 2 Tbsp cold filtered water to thin the soup. This entry was posted in Avocado, Blended, Citrus, Leafy Veggie, Onion family, Raw, Root Veggie, Spices and tagged avocado, bell pepper, carrot, cayenne, cumin, lemon, onion, zucchini. Bookmark the permalink.